On Wednesday Upper School boys participated in a Student Council organized fun run for the Ethiopia Project--Dollars for Ethiopia Scholars. In the short video above, we see lower school boys cheering on the upper school boys as they make their way to Central Park. Upon their return, Lower School boys presented the runners with goodie bags containing water, pretzels, a sugar treat and a hand written note of thanks and congratulations. Dollars for Scholars combined with "Bow Tie Thursday" in the 7th grade today means the Ethiopia Project is well under way. we also held an "oven free" lunch today and presented a special slide show to the boys on the importance of reducing, reusing and recycling, with a special focus, obviously, on bottle caps. The competition ended today with the awarding of unique trophies and certificates by committee chairs, Jessica Pagan and Lauren Franklin. 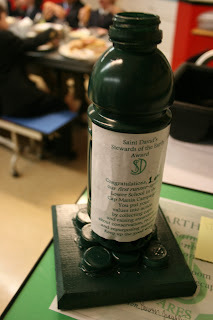 In total to date, the school has collected some 190,000 caps. Some of the delicious "oven free" options offered at lunch today. The Small Lunch Room before the arrival of the Kindergarten. and all food comes from farms within 250 miles of the school. Our centerpieces on each table. class today. Notice the absence of the cap. of the school's five daily lunch sittings. 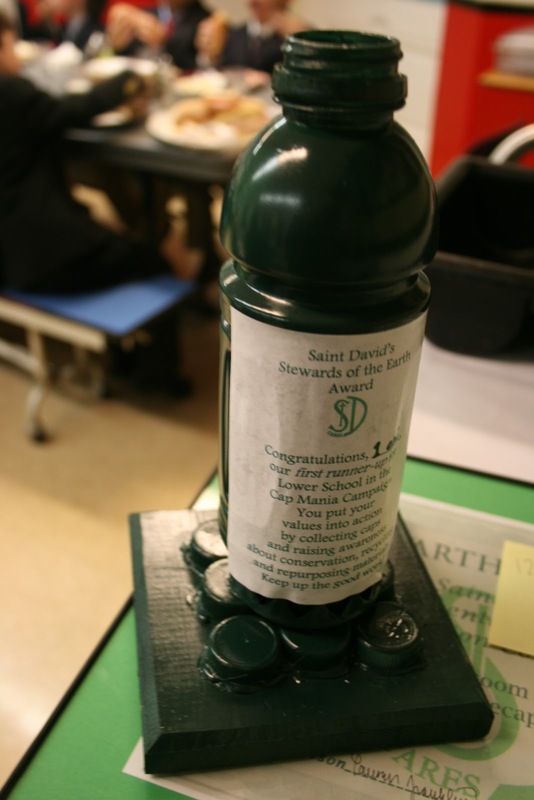 Some of the more than 190,000 caps collected by Saint David's boys this year, to date. 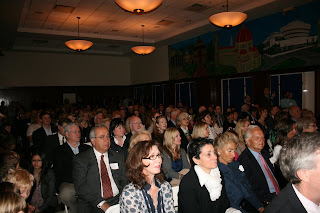 This past Friday, Saint David's celebrated Grandparents Day for the PK, K and Omega grades. Our school was filled with that special sense of excitement that accompanies grandparents wherever they are and wherever they go. In my welcome to grandparents, I made reference to how much the mission of Saint David's values and celebrates family--immediate family and extended family. The lives of grandparents have gone into us--through laughter and tears shared with grandparents we experience our family's past--in us, their history, in so many ways, shapes our future. It has been said that Grandparents hold tiny hands for just a little while, but our hearts forever. 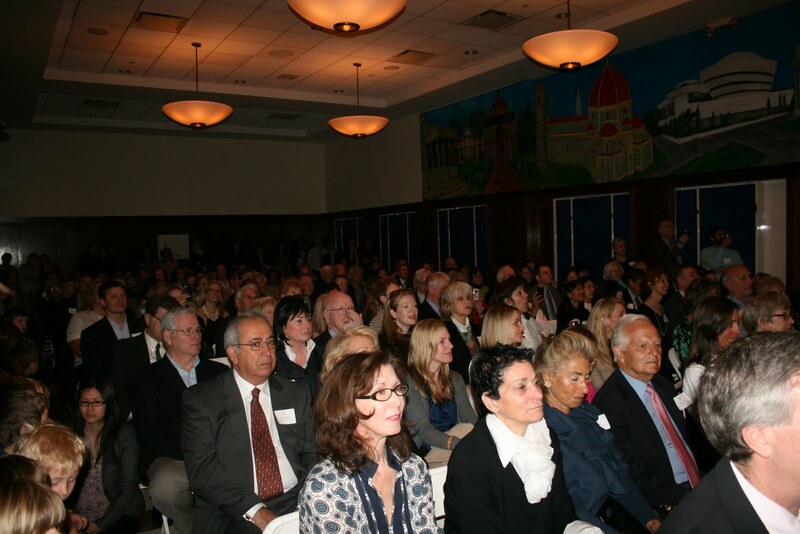 Pictured above is a shot of Hyman Family Hall filled to capacity with grandparents enjoying a special performance by their grandsons before visiting their classrooms. 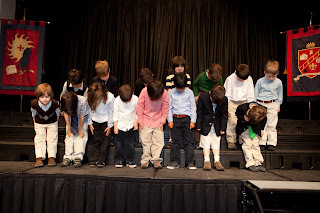 Below are some of the boys taking a bow.